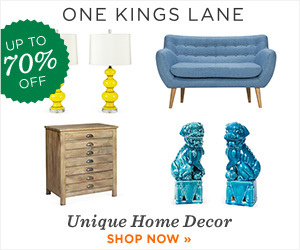 One Kings Lane Day of Kitchen – Big Sale! The One Kings Lane Day of Kitchen sale starts today! This is one of the best sales of the year because of the variety of high quality kitchen items One Kings Lane offers. One Kings Lane is one of the best daily deal sites out there. Each sale only lasts 72 hours and things do sell out quickly. So be sure to check back every day and if you see an item that you like then grab it while you can as it may not be there for long! This One Kings Lane Day Of Kitchen Sale is live from today and ends on 4/26. This 13-Pc Anna Tasting Set is just $29 reduced from $69 retail. There are so many items to choose from you are sure to see something which you love. Remember as well as these great sale items you can get this discount as a new member! Get a Custom T Shirt at Vistaprint for just $2 + Shipping! Take an Additional 25% Off Already Discounted Disney Baby Items at Amazon!